CBS has finally joined the world of video streaming apps with the announcement today of the release of its iOS app. For some time CBS has had various apps out there in the world, but it was missing one of the key ones, a way to watch the network's programming on your devices. The iOS version of an app finally released this morning and can be found in the App Store. The network also announced that Android and Windows 8 apps are en route later in the year. All of the CBS programming will appear on the app with daytime and late night programming appearing within 24 hours of their original broadcasts, but primetime episodes will take eight days to appear in most cases. While not a perfect scenario for trying to catch up on your primetime viewing, it is finally a step in the right direction for CBS. NEW YORK – March 14, 2013 – CBS Corporation today announced the launch of the new CBS App for iPhone and iPad users, offering full-episode streaming of CBS programming from primetime, daytime and late night. The new app further extends the reach of the shows' audience, providing more flexibility and opportunity for catch-up viewing and opens yet another monetization window for the Company's industry-leading content. The CBS App is available for immediate download from the App Store, and offers original and second-screen features for CBS's popular shows such as NCIS, THE GOOD WIFE, CSI: CRIME SCENE INVESTIGATION, HOW I MET YOUR MOTHER, THE YOUNG AND THE RESTLESS and THE LATE SHOW WITH DAVID LETTERMAN, among many others. Daytime and late night programming will be available within 24 hours after initial airing, while most primetime programs will be available on the eighth day after broadcast. CBS also announced it would introduce similar full-episode streaming apps for all major mobile and tablet platforms later this year, including Android and Windows 8. "We have been methodically and strategically finding new ways to satiate the appetite for our content on new platforms, while tapping into the tremendous revenue provided by doing so," said Leslie Moonves, President and CEO, CBS Corporation. "Our announcement today achieves both of these objectives, while protecting our very healthy current ecosystem. In addition, by making our shows available on all the leading mobile devices out there, we are confident we will bring a whole new set of viewers to the CBS Television Network and build upon our standing as the #1 network in the business." "Our online viewers not only want to watch their favorite shows on multiple devices, they want deeper engagement with the programs they love," said Jim Lanzone, President of CBS Interactive. "The new CBS App gives them the best of both worlds, letting people watch CBS shows on the best screen available for them, with a host of extra features that give them a richer viewing experience whenever and wherever they tune in." The new CBS App will integrate the existing CBS Connect App experience by the start of the fall TV season. 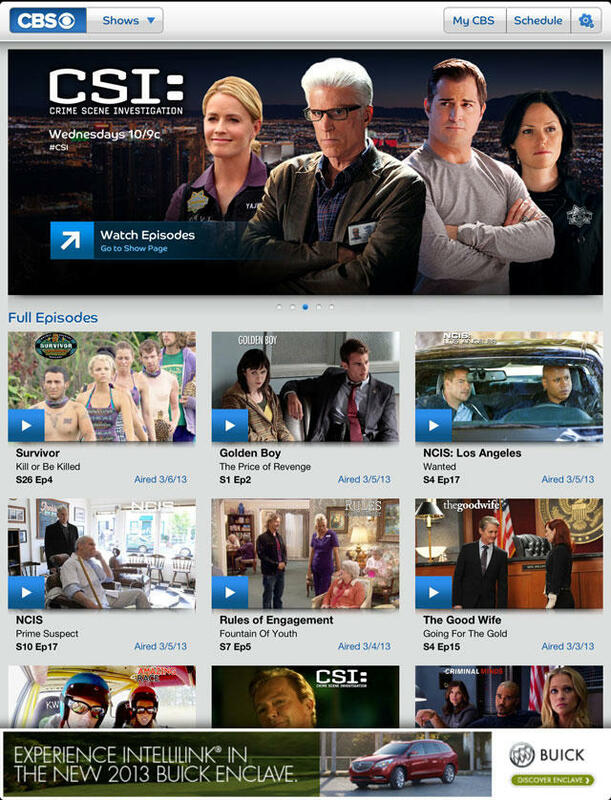 At that time, the CBS App will offer integrated social feeds, live events that allow fans to engage directly with talent, and second-screen experiences synched to the broadcast with additional content for select shows like CSI: CRIME SCENE INVESTIGATION, CRIMINAL MINDS, HAWAII FIVE-O and NCIS: LOS ANGELES. Buick is the official launch partner for the new CBS App, bringing users CBS programming with reduced commercial interruption for the first several weeks after launch. The new app further extends the CBS.com experience to viewers, where the website has led all other broadcast networks in terms of unique viewers for 51 consecutive months (comScore Video Metrix, February 2013).